Notes: St. Cecilia Chamber Choir Lessons & Carols Christmas concert, conducted by Linda Blanchard and accompanied by Sean Fleming. Notes: The St. Cecilia Chamber Choir, conducted by Linda Blanchard and accompanied by Sean Fleming, will present their annual Lessons and Carols Christmas concerts on December 12th at the Second Congregational Church in Newcastle, and December 13th at the Bowdoin College Chapel. Reservations are strongly encouraged for this popular event. Notes: The St. Cecilia Chamber Choir, conducted by Linda Blanchard and accompanied by Sean Fleming, will present their annual Christmas concerts on December 11th at 7:30 p.m. at the Second Congregational Church in Newcastle, and December 12th at 4:00 p.m. at the Bowdoin College Chapel. Reservations are strongly encouraged for these popular events. 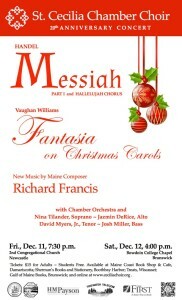 The Choir will continue its 20th Season celebration with Handel’s Messiah, Part I. A favorite of audiences and performers alike, this time-honored masterpiece will be performed with professional soloists and orchestra. 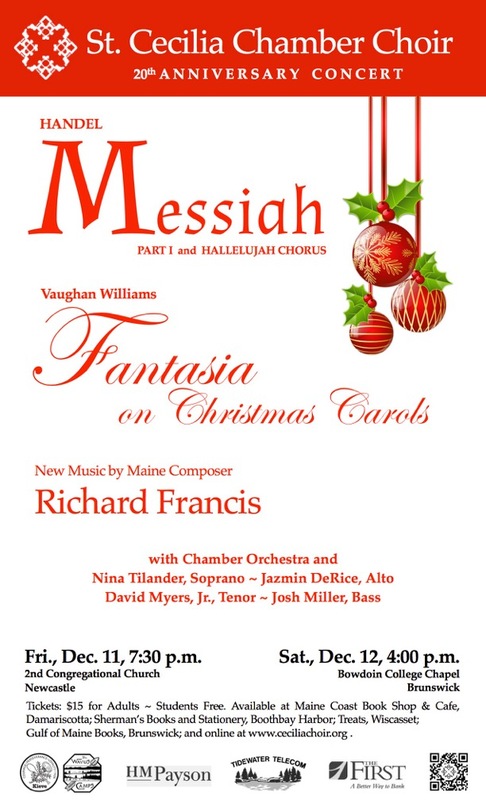 Also on the program is the premiere of new music by Maine composer Richard Francis, commissioned for the occasion. Don’t miss the chance to see one of these special concerts! The Choir is directed by Linda Blanchard, M.A. Conducting, University of Michigan School of Music, Ann Arbor, and A.B. Bowdoin College, and accompanied by Sean Fleming, both of Damariscotta. St. Cecilia Chamber Choir is a fully auditioned community chorus based in Newcastle and founded in 1995. Our mission is to present outstanding performances of the very best choral repertoire; to provide challenging musical opportunities to gifted local youth; to support our community with outreach programs; and to support Maine composers through the commission and performance of new music. For more information about the Choir, please visit our website at ceciliachoir.org.